I came across this fairly new service called SE Ranking, which is a search engine keyword rank tracking tool and thought that I’d use and review the service. I’ve signed up for the 14 day trial to get a feel of it and to import a few of the keywords that my military website is ranking for. So far I like the tool and think that it does its job, even if the interface is extremely simple and straight to the point. The SEO agency I work for uses BrightEdge, and I’ve had to use it quite abrasively — with adding hundreds of keywords and monitoring how clients are ranking in Google. I thought to myself, why not see what the competition are doing and if there is a better alternative? Or if there is a feature that BrightEdge is missing. More so, not everyone can afford the huge monthly price tags that BrightEdge offers, so let’s try and find an affordable alternative that the average Joe can use. I’m currently on the 50 keywords, 5 websites, and 5 search engines package. This works well for me as I really only need to track up to 20 keywords for every website I own. I suspect for other websites that are a little larger than mine that the “Premium” package would be far more suitable. But for $9 per month this is by far the cheapest keyword tracking tool that I’ve come across. It’s this sort of data that’s given to you in this format that makes it easy to see the results of any changes you make, whether off-site or on-site. Another interesting fact is that I actually rank higher in Google UK than in Google USA, and didn’t see any movement, as I rank third for many of those keywords. You can of course select a number of search engines to see how you’re ranking on a day-to-day basis, and I’ve elected Google USA and Google UK, which are the largest providers of organic traffic to my site — so it only seems logical to include them. I don’t think this comes as standard with many of the keyword rank tracking services and this is a feature that I would love in BrightEdge. 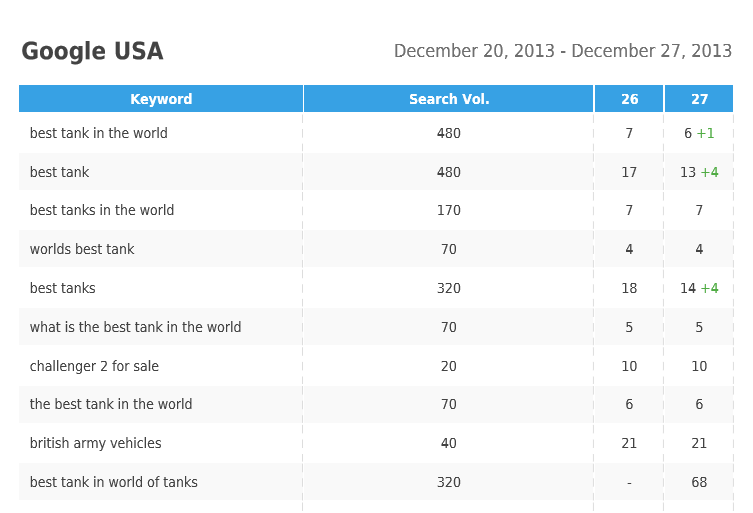 With this tool, you can recheck your keyword rankings by the simple click of a button. This is a great feature, especially if you’re sending a report out and want the latest figures. You’re able to download and export data for reporting. However, this is made easier as they have a custom reporting method setup, which means you won’t have to do too much finger work (teehee) when building a report for either yourself or a potential client. The reporting is far more extensive than just a list of keywords and I’ve only included the keyword tabs/page section as its the most relevant. However, the PDF SEO report delves into organic traffic, so as long as you have Google Analytics integrated with SE Ranking. It’s not a perfect report, and would require tweaking if clients wanted more extensive information, but it certainly does the job of telling you how you’re ranking. I also think that there is a month-on-month reporting system, that compares your month’s daily figures via averages then once you have enough data, your report will include month-on-month reports. I said I’d update this section, as the data was just not there when I created this review post. As you can see, I entered a list of competitors on the keywords that my site is ranking for. 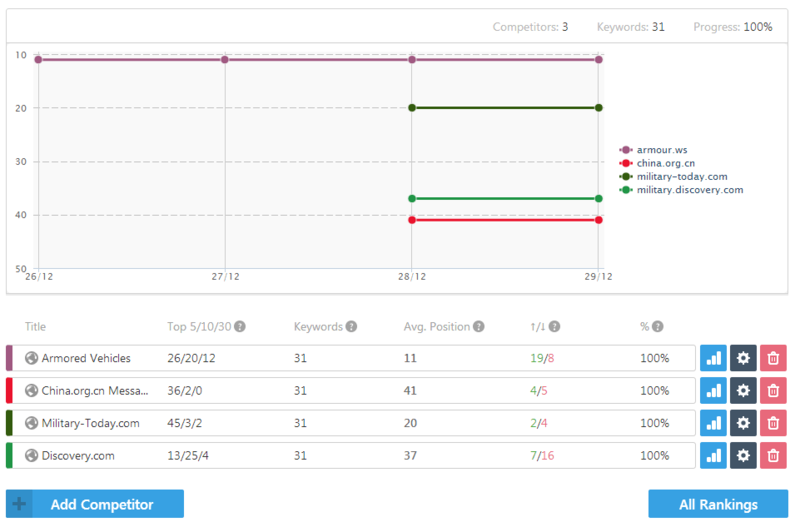 For the keywords I’m tracking, I appear to be at the top. Plus, the military niche doesn’t have a similar article website like mine. Most of the other sites are forums or news websites, which is why my website appears at the top. Either way, this section is quite useful, but would be much more useful for sites that are very similar. I’d definitely recommend trying it out and getting a feel for it. If you just want to see your keyword rankings, then this tool definitely does this job at a very low cost. If you however want an enterprise solution then I’m sure there are more refined tools such as BrightEdge, RavenTools, AuthorityLabs and a plethora of other expensive tools that would work much better than SE Ranking. 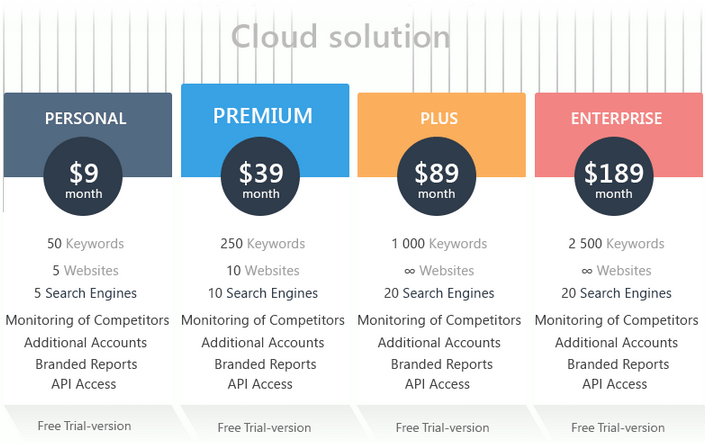 But for $9 per month, you can’t really go wrong — if keyword tracking is all you need. On that note, I’m thinking of putting together a list of keyword rank tracking tools/services that are available, with a short paragraph explaining what makes each unique. Hopefully they’ll all come with 14 day free trials. What’s the discount code for this? Also, I’ve been looking for a cheap keyword rank tracker, that does a simple job like this — so thanks! I recommend trying the 14 day trial, as you may or may not like it!